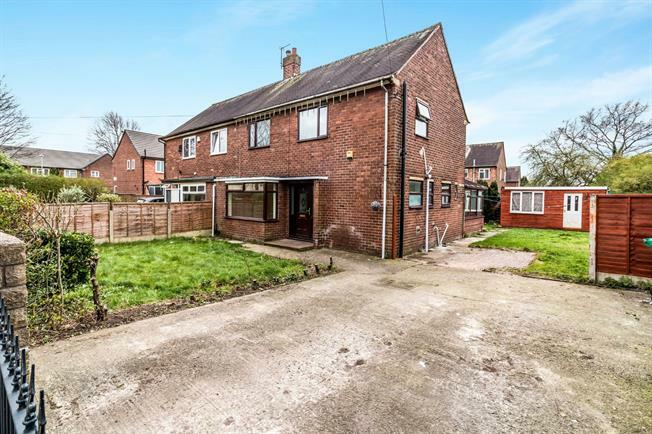 4 Bedroom Semi Detached House For Sale in Manchester for Offers Over £220,000. Viewing is essential to appreciate this substantial three/four bedroom semi detached home situated on a generous plot with a useful summer house in the rear garden. The property briefly comprises lounge, kitchen, conservatory, downstairs WC and potential fourth bedroom/reception room to the ground floor. To the first floor there are three further bedrooms and the family bathroom. Externally, the property is situated on a generous plot with ample off street parking, and both a front and rear garden. Front door opening onto the driveway. Laminate flooring, ceiling light. UPVC double glazed door, opening onto decking. Double glazed uPVC window facing the rear overlooking the garden. Radiator, laminate flooring, ceiling light. Double glazed uPVC window facing the side. Built-in and wall and base units, stainless steel sink, single sink and with mixer tap with drainer, integrated, electric oven, integrated, gas hob, over hob extractor, space for dishwasher, space for. UPVC French double glazed door, opening onto decking. Double glazed window facing the rear overlooking the garden. Radiator.